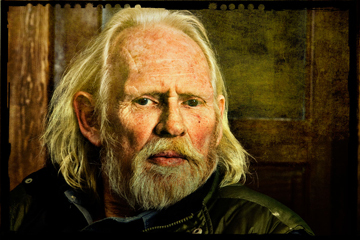 Photo of Peter Bowen by Michael Smith. © Michael Smith. All rights reserved. I was born at the end of WW II and my early years were spent in Colorado and Indiana, where my father was getting his Doctorate. In Colorado we lived in the mountains west of Denver. I could walk a half-mile at night and look out on the lights of the city, which seemed to me an engulfing monster drawing near. Didn’t like cities then and still don’t. In 1955 my father got an appointment at Montana State College, and so we moved to Bozeman. I was ten. There was excellent trout fishing a quarter-mile from our house, bird hunting at the city limits, and mountains to the south and east. Bozeman was new, less than a century old, and my paper route ended at a bar called The Oaks, where old cowboys sat drinking and talking while they waited for death. They were men in their eighties and nineties, and some had ridden up with the cattle drives from Texas, in the l870’s. They told stories, some of them even true, I suppose, and gave me the habit of eavesdropping in bars. You can hear whole novels in an afternoon. Eventually I attended the University of Michigan without much effect on either one of us, and much later a couple terms at the University of Montana. I was in the Writing Program and I would say nothing about it but for the fact that the Chairman of the English Department sent me a letter, which, after listing my defects of character and vile habits, stated flatly that I had never been there, there was no record of my ever having attended anything at the University of Montana, and as they had their reputation to consider, if I claimed I had, I would be sued. I wrote back, mildly pointing out his intemperate language but allowing that his statements were fine with me as I proposed to forget the place as thoroughly as possible. I have received no further correspondence. Like most writers, I tell stories about the places I know and I make up people to go in the stories. These days I live in Livingston, a small town ninety miles north of Yellowstone Park, that was once a major railroad hub – the giant buildings where the engines were rebuilt still stand – and the pollutants – a toxic stew of petrochemicals frosted with asbestos – remain. The town itself has for some reason always attracted writers and actors and artists – and my next effort will be my own take on the town and its people, then and now. I intend to live and die in the West, my native land, and write about it. It is what I do.